The New England Patriots' dominance of the AFC East appears to finally have become too much for their closest neighbors. This off-season the Buffalo Bills and New York Jets have made significant moves to counter-act the Patriots' greatest strengths. Moves made in Buffalo by the Bills have been well publicized with the arrival of Mario Williams and the addition of Stephon Gilmore, however the Jets have made a more understated addition to their arsenal to counteract Tom Brady and co. In the 1980s, Rex Ryan's famous father Buddy Ryan was the defensive coordinator of the Chicago Bears. Ryan was a boisterous character, just like his son, who didn't fear anyone or anything. His approach to football was as aggressive as anyone's which was emulated on the field by his players. A staple of the Buddy Ryan defense was the little used 4-6 formation. The 4-6 formation is not, what you would expect it to be, four down linemen and six defensive backs, it is however one of the most aggressive alignments a defense can employ outside of short yardage situations. Rex Ryan is looking to reignite the 4-6 this year and make it a more prominent part of his defense. The 4-6 is an alignment which puts pressure on the opposition's offensive line. In the 4-6, the defensive line covers each of the two guards and the center while dropping one safety into the box, where he generally lines up on the outside shoulder of the tight end. The weakside linebacker generally fills the gap between the safety and closest defensive linemen with the middle linebacker lined up just behind him. That leaves the strongside linebacker to be between the widest defensive end and defensive tackle covering the guard. In this alignment, defenses predominantly play single coverage outside. The Jets undoubtedly have one cornerback capable of shutting down his side of the field in Darrelle Revis, but Antonio Cromartie could be susceptible and will need safety help very often. This formation allows the eight players in the box to be very aggressive and stress the opponent's pass protection simply by outnumbering them. It is very difficult to compile the personnel capable of executing this formation as, in particular against the Patriots, you need a bullish safety who can succeed in single coverage. The Jets have made efforts to put these pieces in place this off-season. 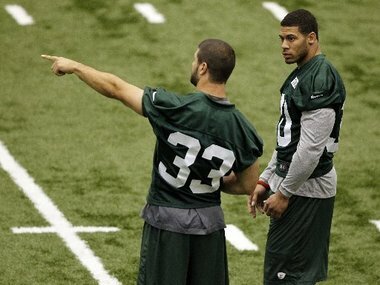 Revis and Cromartie are man cover cornerbacks who were already in place. Sione Pouha and Muhammed Wilkerson are already able to play on the interior of the line while Quinton Coples was added to round out the trio covering the guards and center. With Calvin Pace sliding to defensive end, the Jets have a decent defensive line to run this alignment. However, where they appear to have stumbled is at the safety and linebacker positions. David Harris and Bart Scott were terrible in coverage last year while free agent addition LaRon Landry is one of the least durable players in the NFL. Even if Landry is 100 percent healthy, it is still asking a huge amount of him to contain Rob Gronkowski or Aaron Hernandez against the Patriots. Landry and Yeremiah Bell were brought in with the specific assignment of counter the presence of the Patriots' tight ends with greater physicality. Unfortunately for the Jets, this scheme change doesn't appear to be the greatest way of being obtrusive to the Patriots passing attack. Tom Brady is an intelligent quarterback prior to the snap of the football, while you can do multiple things playing from the 46 front, it does limit you somewhat in your attempts to make Brady hesitate. Brady should be able to diagnose what the defense is trying to do while his offensive line has enough veterans to react to the aggressive pass rush. For most teams, occupying the guards and center would be too much for the team's individuals. However, when you have a group with players like Logan Mankins, Brian Waters, Robert Gallery, Dan Koppen and Dan Connolly, there shouldn't be any major issues with handling one-on-one matchups despite how talented the Jets' inside trio are. While there is a lot of talk about the Jets' bring back Buddy Ryan's 4-6, it is not a formation that the Patriots should fear at all. What the Patriots should fear however, is the Buffalo Bills' defensive revamp this off-season. The Bills are by no means a perfect group, but a less talented version of that team forced Tom Brady into one of his worst games of the year last season. Brady threw four touchdowns in Buffalo, however he also threw four interceptions including one in the fourth quarter which was returned for a touchdown. The Bills aren't the Pittsburgh Steelers or Baltimore Ravens, they don't figure to shut down teams completely next year. They do look like a group who could thrive off of turnovers however and make big plays on a consistent basis. The addition of Mario Williams made many turn their heads this off-season. Undoubtedly the Patriots' new left tackle, Nate Solder, was one of them. While Williams has already declared his desire to play on the other side of the defense, he will be moved around and spend time testing both tackles. Handling Mario Williams is going to be very difficult, but he won't be the Patriots' biggest problem on the defensive line. Tom Brady has more often than not enjoyed a clean pocket to throw from, now that the Bills are employing a 4-3 defense, messers Kyle Williams and Marcel Dareus figure to become the best pair of defensive tackles in the NFL. The Patriots interior offensive line may work well as a group, but Williams and Dareus are too talented to not take advantage of whatever line is put infront of them. With former Patriots' pass rusher Mark Anderson rounding out the defensive line, and Chris Kelsay with Shawne Merrimen, the Bills have the pass rush to frustrate Tom Brady without sacrificing players in coverage. Much like the Giants did in last year's Super Bowl. More importantly however, the Bills drafted a large cornerback in the first round of this year's draft who could make Rob Gronkowski's trips to Buffalo a lot more difficult over the coming seasons. Last year, teams like the New York Giants with Kenny Philips, Oakland Raiders with Tyvon Branch and Pittsburgh Steelers with Cortez Allen, assigned a big body to cover Gronkowski and contain him in single coverage. They didn't need to shut him down, but rather contain him to allow the rest of the defense to function and hold its integrity. With Stephon Gilmore, the Bills first round pick, they believe they have added a player to carry out that role against the Patriots. Gilmore becomes part of a very deep and dynamic secondary in Buffalo which should have no issues with matching up to the team's new receiving corps. Most of the Bills' secondary players will give up yardage but make big plays, Gilmore is their hope to be someone who can do both. As a rookie he likely will see more time with special assignments rather than being a full-time starter however. The Bills' transition to this defense should allow them to rush four and flood coverage. That is the kind of gameplan which the Patriots don't want to face. Much like the Patriots have, the AFC East has undergone some notable surgery this off-season. How these alterations will pan out in the long-term is unclear, but as of right now, it is clear that the Patriots are still the team to beat in the AFC East.